The approach of a long, bitter winter is anticipated by many of us with dread. And so too it would seem for many of our migratory birds. Wetlands and coastlines that teem with shorebirds over summer become still, and our warm, sun-drenched skies that ring with the trill of rainbow bee-eaters and the cackle of dollarbirds fall quiet. As the chill of winter arrives and we retreat to the comfort of our heated lounge rooms, it’s hard to imagine that there could be a paradise unfolding just on our doorstep. In reality, it is not an intolerance of cold that drives many of our summer-chasing species away. When many shorebirds reach their breeding grounds on the tundra of Russia and northern China, there is still snow on the ground and these birds are able to survive despite the frigid conditions. However, this hardship is short-lived as spring quickly takes hold and the warmer weather spurs a flush of invertebrates racing to complete their lifecycles. It is this abundance of invertebrates that has drawn the shorebirds there rather than them simply escaping the cold. The dark bark of an ironbark provides year-round contrast against the grey-green foliage but, on cold winter mornings, this colouration creates an even more evocative sight when frost and fog provide additional contrast. Just as a bounty of food is becoming available in the Northern Hemisphere, so too is a rich food source emerging just beyond the outskirts of Melbourne in the midst of our Southern Hemisphere winter. This food source is not invertebrates; it’s nectar. The box-ironbark forests of central Victoria become a throng of activity in winter as the dominant trees flower and their importance to an intrepid suite of nectarivores is realised. As a winter morning breaks in box-ironbark country, the first feeble rays of sunshine to crest the horizon more often than not reveal a blanket of either frost or fog. It is at these times that the forest is at its most beautiful. The trunks of ironbarks* are almost black in colour and contrast starkly with the white of frost and fog. Their glaucous, grey-green foliage provides another point of contrast and if it wasn’t for the plume of steam created every time you exhale, ‘breath-taking’ would be a fitting description. The little friarbird has, despite its name, quite a large body size for a honeyeater and it uses this to its advantage when defending nectar-laden flowers from competitors. As the warmth of the sun begins to vanquish the frost and fog, flowers in the canopy start to produce nectar for the day. The cool morning air is soon filled with the sounds of honeyeaters as they replenish energy lost during the cold night. Honeyeaters belong to the family Meliphagidae, which contains the highest number of species of any family of Australian birds. On winter days, when the box-ironbark forests are in full flower, it is easy to appreciate this diversity. Many honeyeaters are referred to as blossom nomads. They move in vast numbers around the landscape, following patterns in flowering. A large block of flowering box-ironbark forest is a huge drawcard and many species may descend upon it in large numbers. But a rich nectar source is a valuable commodity and worth defending. Honeyeaters are aggressive by nature and exclude competitors from flowers where possible. Some species are much larger than others and this confers an advantage when it comes to defending their patch. At the top of this hierarchy are the red wattlebird, and noisy and little friarbirds. Their garrulous calls can be heard throughout the forest. This leaves the remaining ten or so species that may be present to compete for foraging opportunities, all the way down to the diminutive eastern spinebill. At times it seems that every available spray of flowers is being used. When so much feeding activity is evident, it is hard to comprehend that all is not well in these forests. Some blossom nomads are in decline. Species including the regent honeyeater and swift parrot are critically endangered and this dominance hierarchy is partly responsible. Since European settlement, approximately 83% of box-ironbark forests have been cleared and what is left is fragmented and degraded. Timber harvesting during the gold rush era and subsequent decades has resulted in many of the largest trees being lost. The big, old forest giants produce much more nectar than younger trees. Together, a dramatically reduced area of forest and a lack of nectar-rich, old trees mean that the volume of nectar produced today is far below historic levels. With many of the best remaining sites dominated by large-bodied species, smaller species are pushed into more marginal areas or have to rely on brief feeding opportunities when the competitive bullies let their guard down. It can get exceptionally cold in box-ironbark country. If you look closely at the surface of this wetland, you will see that it has frozen over entirely. This suggests that every remaining remnant of box-ironbark forest has incredible conservation value, as a whole suite of nectarivorous species (not to mention all of the other plants and animals that call these forests home) is dependent upon them. I highly recommend that you head out to a box-ironbark forest this winter so that you too can appreciate just how many nectarivores they support. The spectacle is definitely worth braving the cold for. The best examples of these forests are Heathcote-Graytown National Park, Chiltern-Mt Pilot National Park and Greater Bendigo National Park. Muckleford Nature Conservation Reserve is another good location closer to Melbourne. Whichever patch you choose, I am sure that it will help ease the suffering on a cold winter’s day. * Ironbark is a common name used for a small number of eucalypt species. In our region it is used for the red ironbark Eucalyptus tricarpa and mugga ironbark E. sideroxylon. Rowan is a PhD student studying seabird ecology. When he's not thinking about the ocean he likes to think about woodland birds. The countryside near Benalla in northern Victoria has been strongly marked by its two centuries of farming and forestry. The logging industries of early settlement have given way to agriculture, and now pastureland spreads like a sea between townships. Speckling the land are a few pockets of heavy, old eucalypts, left behind on roadsides and hard-to-reach hills. It’s not easy finding time to speak with Ray Thomas, coordinator of Victoria’s Regent Honeyeater Project. Any spare second he gets is devoted to restoring the ancient forests that once covered the hills and plains around Benalla. Our conversation twice needed rescheduling – some unexpected rain had brought an unmissable opportunity of extra planting. Acting on small chances like that has clearly paid off. This year, the Regent Honeyeater Project celebrates its 20th year of continuous work in the district, a testament to the tenacity of Ray and his associates. From an initial aim to protect the region’s last fragile remnants of ironbark and box forest, the project has grown in myriad directions: boosting the presence of food trees, to bring migrating birds back to the area; planting wilderness corridors between bushland patches, which allow wildlife movement and prevent inbreeding; a vast network of nest boxes to house rare mammals like the squirrel glider and the brush-tailed phascogale. The program’s eponymous bird has been saved from declining numbers, with wild populations increasing each year. The project has always relied on the donations and cooperation of landowners: “We started out by cold calling, trying to find and fence the remnant box-ironbark forest around the district. That was our goal at the start, just to protect these rare, incredibly important fragments.” In Australia’s famously harsh climate, the idea of giving up any agricultural land was a hard sell. This August, for instance, close cooperation with the owners of an ideal property has allowed the landmark creation of a seed orchard – a carefully choreographed planting that mingles the genes of isolated populations for the first time in decades. Robust and healthy vegetation will be bred from local sources, functioning as a new patch of forest while also providing seedlings for future locations. It’s a vital measure to stave off the effects of inbreeding, which has become so severe in some places that plants are incapable of reproducing. The RHP team have always had another goal in mind: to work with the community rather than just amongst them. One of the keystone decisions was to bring schoolchildren from Benalla, Wangaratta and the nearby districts to help with planting. For Ray, involving schools was a crucial component of the project’s early design. The goal was to encourage members of the community to begin thinking about their land as early as possible, and to begin taking ownership: “We’ve included school groups from the first year of the project. Year One. There wasn’t much point otherwise – this needs to be bigger than any of us who are on the inside. 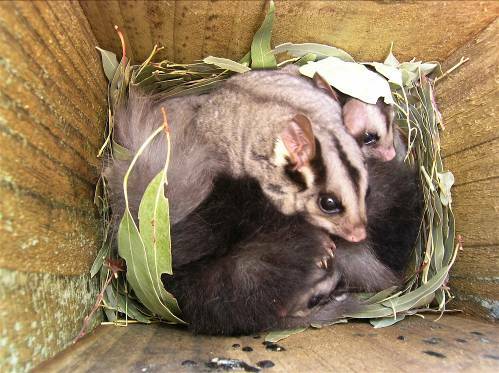 Squirrel gliders use the nest boxes set up by the Regent Honeyeater Project team. 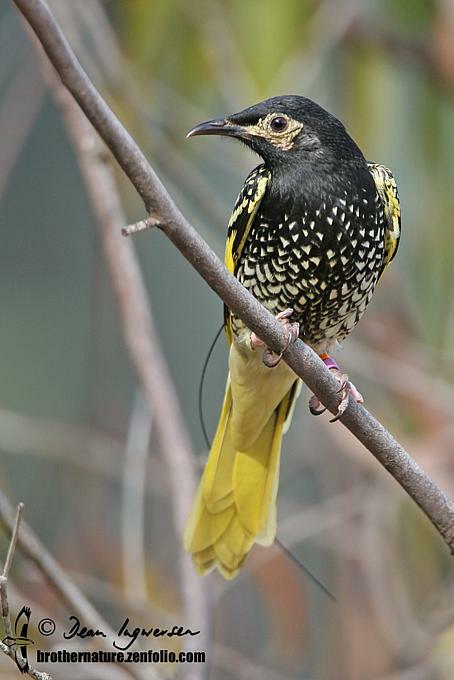 Image curtesy of the Regent Honeyeater Project. That idea of patient nurturing is central to Ray’s operation: “There’s no point in pushing, or aggressive arguing. One thing we’ve found over the years is that people are ready when they’re ready – they need to decide on their own, and there’s nothing we can say to force that. It’s best for people to digest an idea in their own time. That way when they come to us they’ve chosen to, and it creates longevity and faith in the project. Of course, there’s no chance to rest on their well-deserved laurels. Monitoring and understanding the benefits of the revegetation is crucial in shaping the future direction of the project. With ever-present restrictions on time, labour and funding, selecting actions with the most benefit is an uncertain business. “There have been some studies published about the vegetation establishment success rates, and some trapping studies looking at the insects and reptiles using the sites. But they were quite early in the program – sites are less weedy now, with changing bird populations. One of our rarest birds, the grey-crowned babbler, has increased from 50 to 120 birds over the past decade. It’d be great to know more about how they’re using the space. And our nest boxes – we’ve got years of data collected by volunteers about box occupation. Squirrel gliders and phascogales move through our corridors just four or five years after planting. 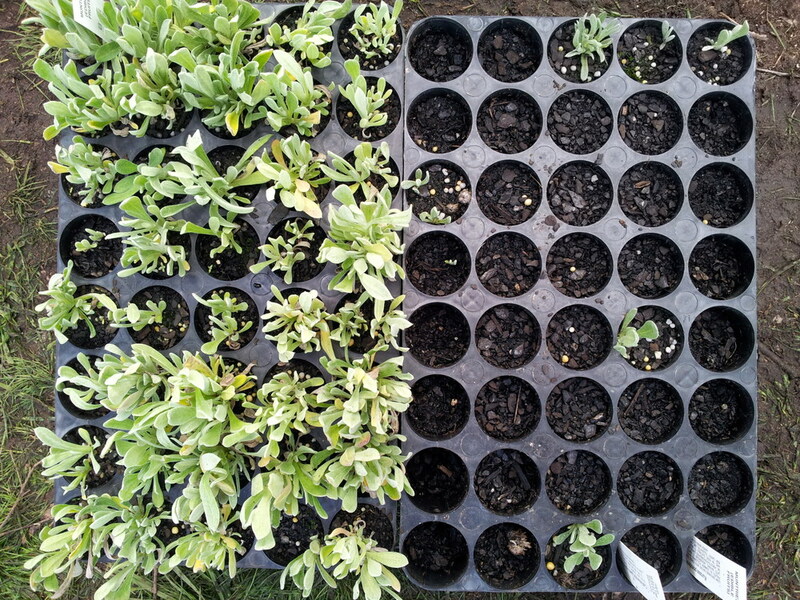 Our data from this year hasn’t been compiled yet, because we’ve been so busy with growing and planting and collecting. We need to look at how we’re going if we want to be as smart as possible next year.” The next year, next season, is always under scrutiny. It’s a fair point. While the Regent Honeyeater Project has given us a stalwart example of community achievement, we mustn’t settle into the idea that a few others will do the work. The chance to make a change is open, for anyone who wants to step forward.